Attention small business owners of Fort Collins, Denver, and beyond: do you have accounting software that you can trust? If you do, it’s likely that you have Intuit QuickBooks, which more than 85 percent of small business owners say is an essential tool for running their business. If you don’t, then you need to get setup with this cloud-based business bookkeeping solution — and our Fort Collins CPA firm can help! At O’Dell & Company, our aim is to provide our clients, a majority of whom are small business owners, with the solutions and support they need to run an efficient, profitable business. Through our handy O’Dell & Company Client Center, our partners can easily access the documents and software that they need at any given time; from our online tax organizer to the QuickBooks online login. Keep reading to learn how to use QuickBooks, and more importantly how it can be used to help run your business, and contact O’Dell & Company today to get started with a solution of your own. Quickbooks is a simple, reliable cloud-based software system which makes organizing back office operations easier than ever. QuickBooks connects to your company bank account and credit card account(s) to provide a quick overview of the health of your business, expenses, and profits. All of this is shown on the QuickBooks dashboard when you login. This provides an an easily digestible summary before you dive into the other elements. 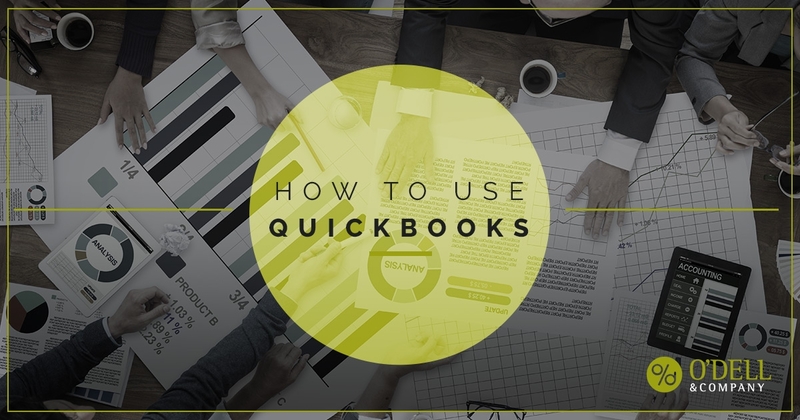 By connecting Quickbooks with your accounts, the painful data entry process is completely automated so that you don’t have to spend countless hours on inputting data for yourself. You can view expenses, categorize transactions, understand profit and loss reports, and a whole lot more. All of this is possible without having to filter through endless piles of paperwork and stress. Manage sales and income with an ability to track sales by customer. Organize expenses and track inventory. Control cash flow and set up automatic bill payments. Create a custom invoice and sales receipt template for your business. Add a “Pay Now” button to online invoices for quick customer payment. View the dashboard and see how your business is performing. Give access to your CPA firm so that they can view and collaborate with your records and assist with tax planning. Manage your payroll, taxes, and more. Ability to access your dashboard, payroll management, and other features from anywhere! QuickBooks accounting software is an essential resource for small business owners who want to eliminate the stresses associated with bills and tax planning. Our trusted Fort Collins CPA firm can help you get setup with this one-stop business accounting solution. All you have to do is call today. So now that you know why you should you use QuickBooks, why should you choose O’Dell & Company to help run your business? Well, it’s really quite simple. Our dedicated, knowledgeable, and experienced certified public accountants provide unparalleled service and support to all of our small business clients. Whether you’re starting a new business in Fort Collins or running a family shop in California, our Fort Collins CPA firm can help. Our local accountants go above and beyond to deliver the solutions and results that you are looking for. Our aim is to help you run, and ultimately grow, your business by providing reliable solutions for all of your business accounting needs. From tax planning to business consulting to providing seamless cloud-based software services, O’Dell & Company truly does it all. Contact our CPA firm today to get started with QuickBooks or any one of our accounting services. Start Your End-of-Year Small Business Tax Planning Now! How Can A CPA Firm Help You?